Two years ago, I took over the management of Kerner Optical in an attempt to ‘right the ship.’ Now, with the deepest sadness and regret I am writing to say that, effective immediately, Kerner Optical, LLC is closed for business. I would like to thank our staff, customers, suppliers and supporters for the unbelievable commitment I have witnessed over the last two years. This announcement is highly frustrating for me considering the gains we have made in 2011 -- gains that we could never have made without the hard work, dedication and sacrifices made by everyone on our team. Kerner Optical filed for protection under Chapter 11 of the United States Bankruptcy code in early 2011 in the hopes that we could reorganize the company. We did this because the debts and liabilities incurred in the company’s first three years of operation were insurmountable. 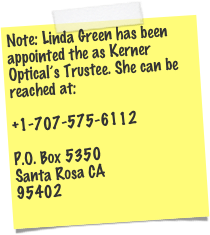 Kerner Optical has been a loss-making company since its inception. This year, the company posted its best-ever January-to-July results and was having its first profitable year in its history. This improvement in our business results and outlook took place despite the uncertainty created by our Chapter 11 filing and largely because of unwavering support by our largest customers. It also took place because everyone on our team went well past the call of duty to deliver the highest quality work on the tightest possible budgets. The closure of Kerner Optical is by no means a failure of our team. As we approached the completion of our reorganization, we were also encouraged by the support of many of our creditors -- Entertainment Partners in particular was highly supportive of our efforts. Further, last week we confirmed that we had attracted enough ballots from our creditors -- more than enough in fact -- to have our Reorganization Plan confirmed by the court. In the end, the trouble lay in the objections of a single creditor -- a creditor who was a member of the management team that saddled the company with so much debt in the first place. Sadly, that creditor's objections, combined with his disingenuous allegations of mismanagement -- made despite his awareness of the company's recovery, success and profitability under new management -- created enough uncertainty that our largest customer was forced, this week, to award a major contract to a competitor. Without that contract, we are unable to continue with our reorganization. As you can imagine, I am deeply saddened and disappointed. It is so frustrating to have come so close to recovery and success only to fail at the last possible moment. Once again, I would like to thank our dedicated clients and suppliers for their support throughout this difficult time. I would also like to applaud our team for their outstanding dedication, sacrifice and effort -- it has been heartwarming to see such tremendous commitment from everyone. For five years, Kerner Optical has delivered some of the highest quality work in our industry. It has been a privilege to work with such an incredible and talented group of people. Thank you all and I wish you the very best luck in your future endeavors. PS: Please note that the closure of Kerner Optical does not impact Kerner 3D Technologies, the manufacturer of the Kernercam 3D Capture System. PPS: I wrote a letter to the US Trustee detailing some of the activities and events that I thought might be of interest to the Estate and to the Creditors. If you would like a copy of that letter, please click here.